The Aspen Collars Use A Unique Technology For Height Adjustment Which Allows 6 Positions Of Height And A Universal Fit. 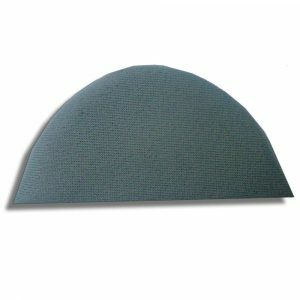 The Special Foam Pads Are Perfect For Long Term Use And Preventing Skin Irritation. 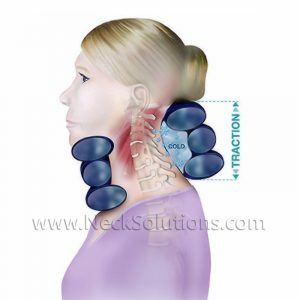 The TX Model Has A Thoracic Extension – The Piece In The Back Extends Further Down The Neck For Additional Stabilization. 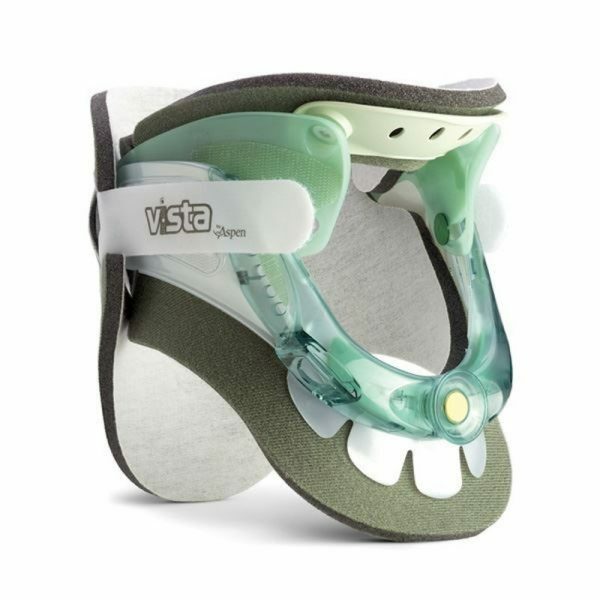 The Vista Collar Comes With An Extra Set Of Pads – The TX Model Does Not Include An Extra Set. 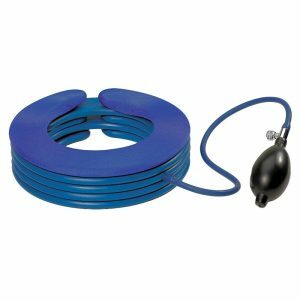 Consider The Universal Collar With Thoracic Extension & Extra Set Of Pads For Similar, If Not Better Quality With German Engineering, Design, & A Great Price – A Smarter Option. The Vista Cervical Collar uses a unique technology for height adjustment which allows 6 positions of height and a universal fit. The special foam pads are perfect for long term use and preventing skin irritation. The standard collar (left below) uses minimal back side support. The TX Model (right below) uses a thoracic extension for increased cervicothoracic stabilization. Replacement pads are available individually when needed. 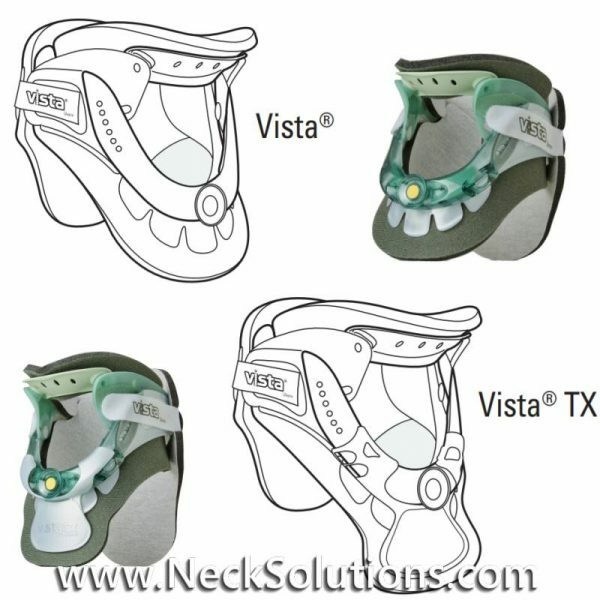 This are the Vista Model neck braces increased comfort & control. 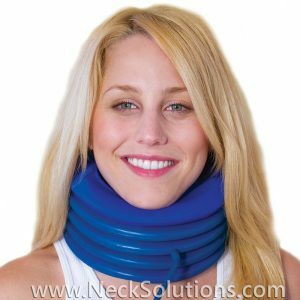 In the event that you will have a surgical procedure approaching and you may require an adjustable cervical collar intended for better support or perhaps you currently have neck discomfort and therefore are seeking a product that may help you manage neck pain. 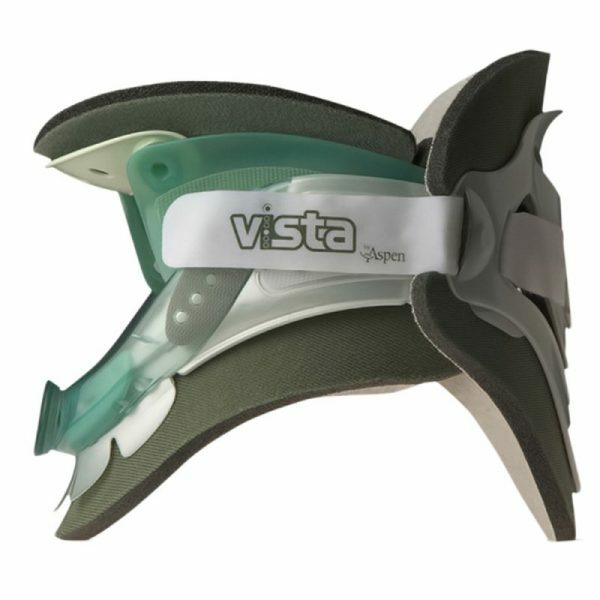 Using just one size to fit all, the Vista Cervical Collar will fit nearly all individuals in the best comfort possible. 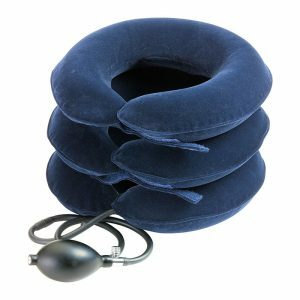 Its distinctive style and design offers ease and comfort, as well as movement limitation necessary in order to safeguard unstable and painful neck conditions. An individual can certainly rest assured of correct sizing for the best fitting, which is important in times of injury or surgical recovery. Because the one sizing, adjustable as well as compact style, the new Vista line from Aspen is rapidly becoming the rigid cervical collar of choice by professionals. 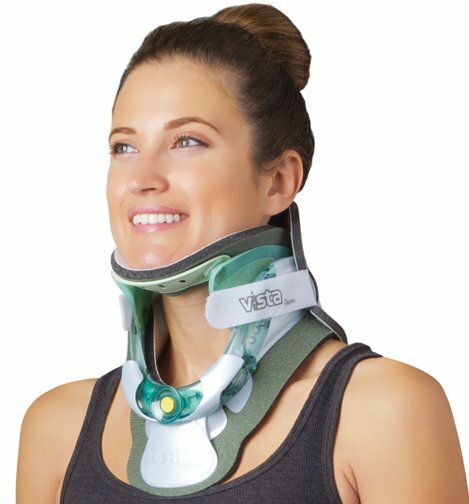 The adjustable universal collar provides a one size fits all design with secure velcro fastening for neck width adjustment and a special adjustable height system to get quick plus reliable adjusting doctors need to manage cervical spine stabilization. 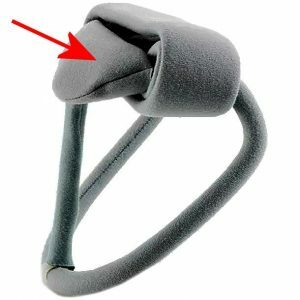 The adjustment knob makes it easy to select the correct height for fine control of head and neck support in one collar. 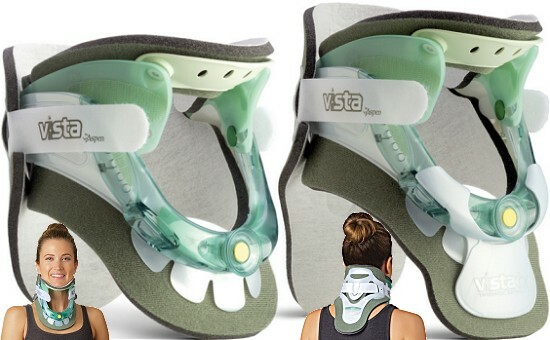 It provides secure and comfortable support, is lightweight, attractive, anatomically designed and able to be adjusted for a universal custom fit. One of the concerns about using cervical collars after surgery, fracture stabilization or other conditions requiring long term use is the skin breakdown, which can form painful ulcers where the skin contacts the collar. 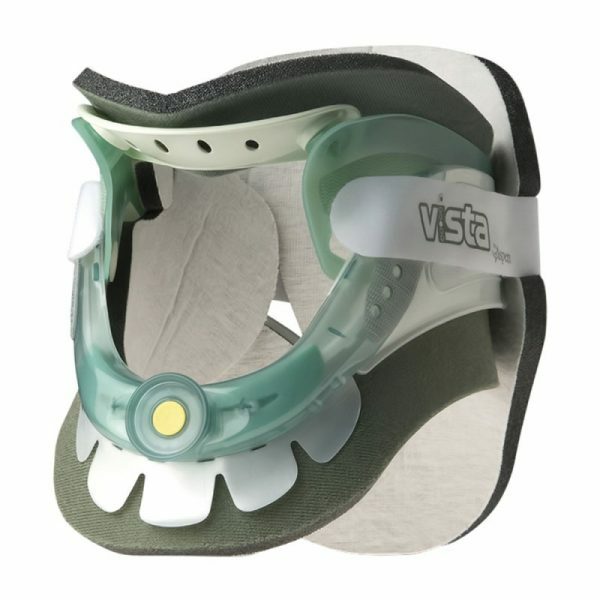 Using the Vista Cervical Collar, a publication in Ostomy/Wound Management An Ohio trauma center investigation of the problem found it was due to collar construction and trialed the Vista Cervical Collar, which resulted in no skin breakdown or pressure ulcers in 20 patients. Further trialing led them to conclude this problem with cervical collars has been eliminated. 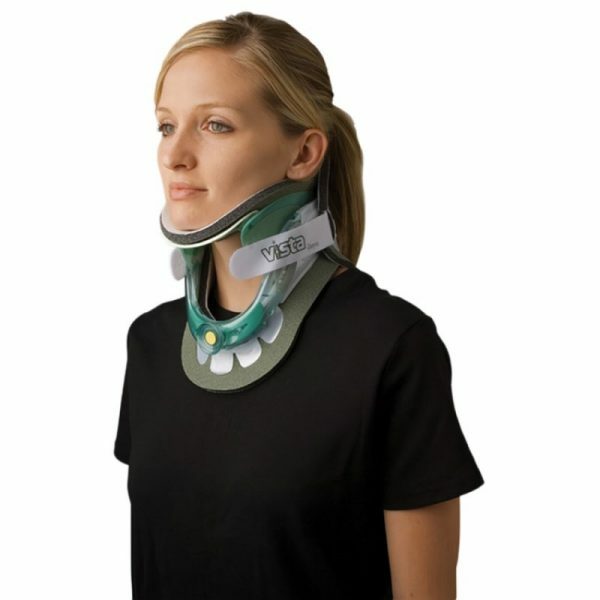 In the Journal of Nursing Care Quality, they found ulcers from rigid cervical collars are a common and difficult to manage problem of immobilizing the cervical spine for trauma patients. Noting a single incidence of pressure ulcers from a collar can cost over $4.000.00 for treatment. 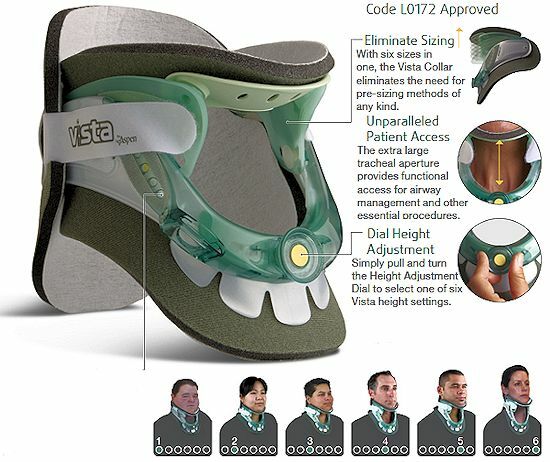 Using the Vista Collar on trauma patients for a year and out of 76 patients, only 1 had skin breakdown due to use of the wrong size collar. The new Vista line eliminates sizing with a one size fits all universal collar. In the Journal Of Trauma Nursing, a study of 484 patients noted the number of days using a collar significantly predicted skin breakdown and indicated a very low occurrence of skin breakdown complications using the Aspen Collar. 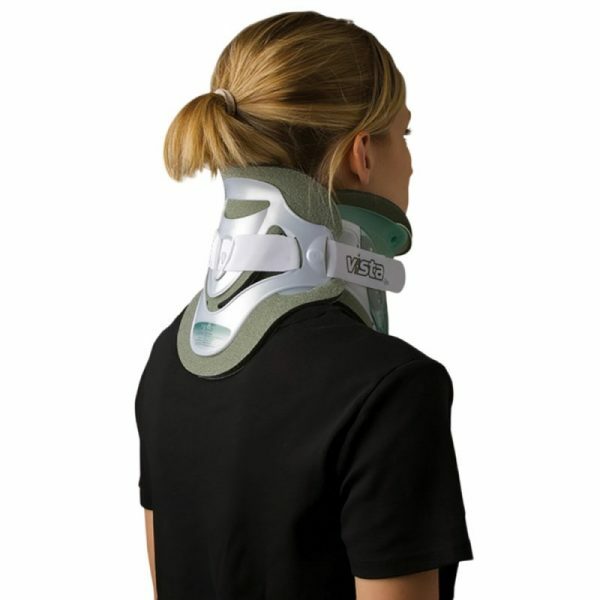 They further noted the collar was effective and safe to use in suspected and actual spine or head injuries. The authors indicated that 5 days or more in a collar produced a risk factor of 55% in suffering skin breakdown. The complications resulting in increased hospital care may result in $30,000 more in costs. 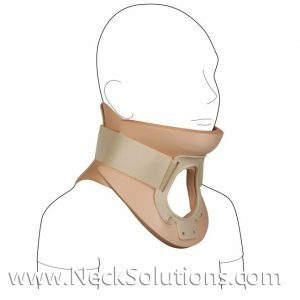 Therefore, the benefits of a collar that avoids skin breakdown, as well as proper fitting is crucial. A 2013 study in the European Spine Journal found that the Miami J and the Philadelphia Collars significantly restricted flexion and extension more than the Vista using a 3D kinematic motion analysis system. The Aspen Vista appears better in regards to comfort and reducing skin breakdown. A study in the Spine Journal determined effects of an improperly Miami J collar. They noted due to financial constraints, limited availability, and application in emergency, it is fairly common that a patient will be fitted with a collar not optimal for body type and size. Ill-fitted braces are often seen in low volume heath care facilities and rural areas where all possible brace sizes are not readily available. The authors indicate a poorly fitted collar that is too small or too big could add to the 3 to 25% of injuries to the spinal cord after initial injury. The new Aspen Cervical Collar allows a range of fitting in just one collar, which can increase proper fitting and is easily managed for stock with just one size collar for all applications. While a 2010 study in the journal Spine found that rigid collars were more restrictive than soft collars, there was no difference in the list of functional daily activities performed, it is reasonable to employ more rigid collars for more difficult cases involving immediate stabilization due to fracture, suspected fracture or significant injuries to the cervical spine. Soft collars appear sufficient in motion restriction for routine daily activities until the normal range of motion has been restored. 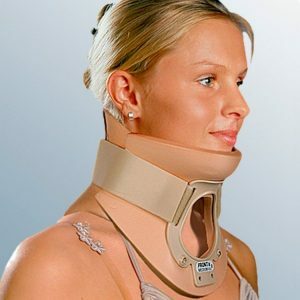 Remember, a high quality soft collar should be used for daily activities rather than a cheap foam collar that provides little to no support, simply serving as a reminder to self monitor cervical motion. 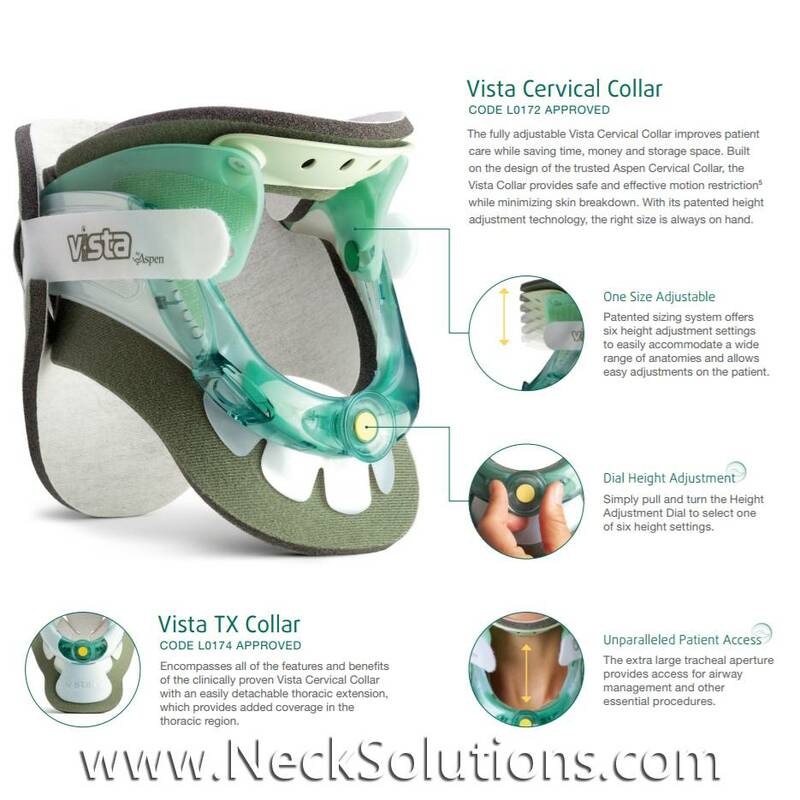 This is different from the functioning and clinical application of the Vista Cervical Collar.